After the Enterprise encounters another dangerous ion storm, it puts in at Starbase 11 for repairs. Unfortunately, the damage to the ship is the least of their problems; the records officer, Lieutenant Commander Benjamin Finney, was killed when Captain Kirk was forced to jettison an ion pod with him still inside. You wouldn’t believe the amount of paperwork this creates! Kirk even has to wear a fancy shirt to deliver his sworn deposition to the grim-faced Commodore Stone, who is probably the longest-surviving red shirt in Starfleet. Spock beams down with an extract from the ship’s computer logs to supplement Kirk’s report, and a moment later a girl cosplaying as Sailor Mercury bursts into the room. This is Jame (pronounced “Jamie”) Finney, and she accuses Kirk of murdering her dad. 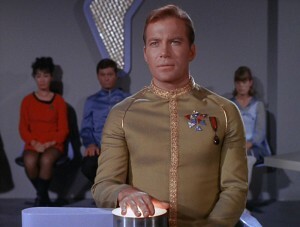 After Spock escorts the sobbing girl out of the office, Commodore Stone accuses Kirk of perjury, since the computer records indicate that the captain jettisoned the pod before calling for a Red Alert. He’s confined to the starbase while they decide whether he’ll face court martial.